This is the Holy Grail of Pumpkin recipes! You know, that one recipe that everyone begs you to bring to get togethers and functions. That recipe that everyone ask for over and over again. 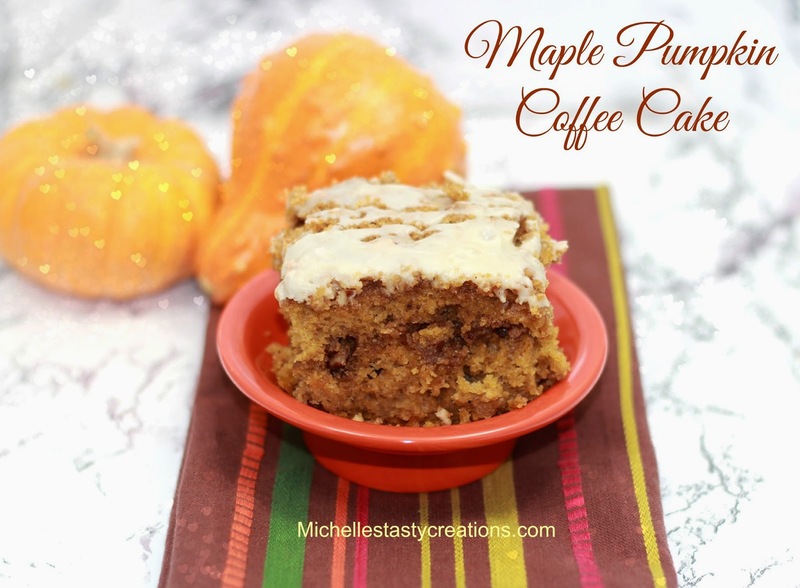 This Pumpkin Maple Coffee Cake is the best reinvention of a recipe I have made so far. Do you take recipes you love and reinvent them into other delicious recipes? You really should because it's magical when it turns into something even better. Preheat oven to 350 and spray a 9 x 13 baking dish with baking spray then set aside. In the bowl of a stand mixer or a large bowl place all the cake ingredients and mix on medium speed for two minutes, scraping down the sides as you go. While the cake batter is mixing, place all the filling ingredients except the butter in a bowl and mix with a fork. Pour the melted butter over the top and mix until it resembles wet sand. Pour half the batter in the prepared baking dish and spread out to the edge. Sprinkle half the filling over the batter in an even layer. Pour the second half of the batter over the filling and spread as gently as possible to the edges. Sprinkle the remaining topping over the batter covering the whole top of the cake. Bake for 43-48 minutes. Mine took exactly 45 minutes. Or until a toothpick inserted into the center comes out clean. In a small bowl mix the powdered sugar, vanilla, and water until the right consistency for a drizzle. Using the whisk drizzle the glaze over the top of the coffee cake (may be done while it is slightly warm). If you can, allow the glaze to set up for at least 30 minutes (but not necessary). Mmmm mmmm BEST COFFEE CAKE EVER!!!!! Oh my! This sounds like a perfect dessert and / or breakfast. The flavors are so comforting. And warm this would be good with a cup of tea. Thanks for sharing. Thank you so much Linda! I love this one too.